Bifurcation is appropriate, if not necessary, in all but exceptional patent cases . . . . [I]n my experience, discovery disputes related to document production on damages and the Daubert motion practice related to damages experts are a drain on scarce judicial resources. . . . I have concluded that bifurcation promotes the just and efficient resolution of what damages, if any, should be awarded by: (1) giving the parties -- those with the most expertise in the market -- the first opportunity to translate [the] decision on liability into practical commercial consequences; or (if the parties cannot resolve the matter) (2) giving the damages jury a focused dispute to resolve. StreamServe AB v. Exstream Software LLC et al., 1-08-cv-00343 (DED August 26, 2009). That same day, Judge Robinson issued an order in Robert Bosch LLC v. Pylon Manufacturing Corp., 1-08-cv-00542 (DED August 26, 2009) again granting bifurcation of liability and damages, but this time clarifying that she includes willfulness as part of the damages analysis: “[U]ltimately, a finding of willfulness is of no moment unless and until the district court, in its sole discretion, chooses to increase damages by reason of the finding; willfulness is a damages issue, not a liability issue." Nationwide, there does not seem to be a clear trend. In the past 12 months, district courts in the United States have issued substantive rulings on 19 motions to bifurcate liability from damages in patent cases. 11 were granted and 8 were denied. As shown above, only Judge Jones deviated from his own track record. However, the circumstances and basis for the motions in each case were significantly different from each other. Compare IGT v. Alliance Gaming Corp., et al., 2-04-cv-01676 (NVD May 29, 2008) (denying motion to bifurcate antitrust claims from patent claims brought on the “eve” of trial) with Japan Cash Machine Co., LTD v. MEI, Inc., 2-05-cv-01433 (NVD November 20, 2008) (granting motion to bifurcate inequitable conduct from infringement). Stated differently, 83% of the decisions on motions to bifurcate have been consistent with a judge’s other bifurcation rulings. The court granted plaintiff's motion to strike defendants' affirmative defense of unclean hands based on plaintiff's alleged improper marketing activities promoting off-label uses of its product. "[I]t is clear that Defendants have not . . . alleged that such misconduct gave rise to or affected the patent rights or cause of action now pursued by [plaintiff]. In the absence of such a connection, an unclean hands defense is not viable, as 'courts in this Circuit have generally been clear that the connection between the misconduct and the claim must be close' . . . [However] evidence of such misconduct may be considered as a factor affecting [plaintiff's] ability to obtain a permanent injunction as relief in this proceeding." Judge Robinson: "Bifurcation is Appropriate, If Not Necessary, in All But Exceptional Patent Cases"
In bifurcating damages and willfulness from infringement and validity, the court explained: "Bifurcation is appropriate, if not necessary, in all but exceptional patent cases. . . . [I]n my experience, discovery disputes related to document production on damages and the Daubert motion practice related to damages experts are a drain on scarce judicial resources. . . . I have concluded that bifurcation promotes the just and efficient resolution of what damages, if any, should be awarded by: (1) giving the parties -- those with the most expertise in the market -- the first opportunity to translate [the] decision on liability into practical commercial consequences; or (if the parties cannot resolve the matter) (2) giving the damages jury a focused dispute to resolve." This ruling, with a free link to the actual signed order, was reported in today's Docket Report. 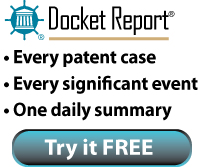 If you are a patent litigation practitioner, you can request a free 2-week trial of the Docket Report by sending an email to trial@docketnavigator.com. To learn more about the Docket Report, visit https://www.docketnavigator.com/everyday. Defendant's motion to transfer venue for convenience was granted. In addressing the "relative ease of access to sources of proof" factor, the court determined that the location of documents in the Northern District of California (defendant's documents) and the Western District of Texas (plaintiff's documents and possibly some of defendant's documents) favored transfer. "Following the approach of [In re Genentech, 566 F.3d 1338, 1345-46 (Fed. Cir. 2009)], the court concludes that this factor weighs in favor of transfer. . . . If the case remains here, all documents will still have to be somehow transferred -- or perhaps simply downloaded to a flash drive and then transported -- from either the Northern District [of California] or the Western District [of Texas] to the Eastern District [of Texas]." Defendant's motion to dismiss plaintiff's counterclaim of inequitable conduct for failure to state a claim was granted. "When examining a continuation application, the patent examiner will consider the information that was considered by the PTO in the parent application. . . . [A]ny prior art references and/or rejections that are part of the file history of the parent application are considered when examining the continuation application. The applicant is under no duty to resubmit such information in the continuing application. Therefore, it is not inequitable conduct for an applicant not to resubmit information that is already before the PTO in the parent application." In granting defendant's motion to dismiss plaintiff's patent infringement claim for lack of standing the court rejected plaintiffs' argument that the rights retained by the patent owner were "insubstantial." "Plaintiffs acknowledge that the [patent owner] retains rights to the non-commercial, educational use of the patents. . . . [T]hese retained rights of use actually demonstrate an absence of complete exclusivity, which in this Court’s view is key to the issue of whether there was a conveyance of all substantial rights." Following a jury trial, defendant's motion for judgment as a matter of law of no induced infringement was granted in part even though defendant taught customers the accused infringing use in "training courses" and "video presentations." "[The separate accused products] may have been presented 'as a single homogenous system' to [defendant's customer], but this is not a substitute for evidence of what any [of defendant's] customer(s) actually did. Because it was not disputed that a . . . customer does not necessarily have to install and run [a particular] feature, plaintiff was required to identify at least one specific infringement by customers. . . . Having failed to do so, the jury's verdict with respect to the system claims must be reversed." The court granted defendant's motion for summary judgment on plaintiff's inventorship claim, rejecting plaintiff's argument that the named inventor's thesis advisor was a co-inventor. "The Court concludes that the record evidence cannot support a reasonable finding that there was more than one inventor of the [patent-in-suit]. [Plaintiff] rests its contention that [the alleged co-inventor] was a co-inventor of the [patent-in-suit] on two central foundations: (1) that [the alleged co-inventor's] Feb. 1, 1999 email communicated two ideas that were subsequently incorporated into the claimed invention; and (2) that the extensive email correspondence between the [alleged co-inventor] and [the named inventor] reveals an extensive collaboration that supports co-inventorship. The undersigned finds that neither contention finds sufficient basis in the record to support a finding of co-inventorship, nor creates a genuine issue of material fact such that summary judgment in favor of Defendant should be precluded." Following a bench trial concerning Merck's Singulair® patent, the court rejected Teva Pharmaceutical's validity and unenforceability defenses and concluded that Teva's ANDA applications infringed the patent-in-suit. "[T]he Court . . . concludes that Teva has failed to prove either that: (1) [Merck] acquired the ‘473 patent through inequitable conduct or (2) the ‘473 patent was obvious under 35 U.S.C. § 103 . . . As such, the Court concludes that the ‘473 patent is valid and enforceable and that Teva’s ANDA[s] . . . infringe claims 18-22 of the ‘473 patent." Plaintiffs were precluded from asserting infringement against wireless controllers for Microsoft's Xbox 360 game system because plaintiffs failed to identify the controllers in their interrogatory responses. "Plaintiffs contend that they properly supplemented their interrogatory answer [after the close of discovery] because they notified Microsoft in their supplemental answer to interrogatory No. 1 that their answers were preliminary, as discovery was ongoing and expert discovery had not yet occurred. This 'boilerplate' response does not eviscerate the Court’s discovery deadlines and create an open season for discovery." Motion by Dorsey & Whitney LLP to withdraw as counsel for plaintiff was denied and the court found no conflict warranting such withdrawal under the Washington Rules of Professional Conduct. "Dorsey represents a patent holder claiming that a cellular telephone service provider is infringing one or more of its patents. Dorsey also provides unrelated legal services to a manufacturer of cellular telephones that has an exclusive service arrangement with the provider being sued in this matter. . . . The Court is not persuaded that Dorsey has a concurrent conflict of interest. . . . Even if Dorsey might have good cause for withdrawal, the Court may and does order Dorsey to continue representing plaintiff. . . . This case will be considerably delayed if Dorsey is permitted to withdraw and new counsel is required to make up the ground already covered. Moreover, given the potential impact of this litigation on a large number of cellular telephone manufacturers, plaintiff would likely face significant challenges in retaining substitute attorneys who are free from conflict and experienced in patent litigation. The Court therefore concludes that the administration of justice would be best served by Dorsey remaining plaintiff’s counsel of record." Claim containing the term "means for individually cueing said callers of said select subset to prompt digital signals" was invalid as a means-plus-function limitation lacking structure beyond a general purpose computer. "[Plaintiff] argues that the recited function is shown by step 72 of Figure 2 [of the specification]. . . . Specifically, [plaintiff's expert] says that in box 72 the caller is cued and the answer of the caller is registered. However, a simple box with the term 'register answer' is not an algorithm. [Plaintiff's expert] also cites to two other passages in the patent. These passages do not describe any algorithm for 'individually cueing said callers of said select subset to prompt digital signals.' Rather they simply indicate that the interface processor poses questions to the callers. Based on the foregoing, this Court finds that claim 5 of the [asserted] patent is invalid as indefinite." Defendant's claim of infringement under the doctrine of equivalents was barred by prosecution history estoppel. On the question of whether the subject matter surrendered by the narrowing amendment encompassed the alleged equivalent, the court explained: "[T]he territory between vectors comprising isolated DNA molecules comprising sequences selected from ORFs 1-13 of any organism and vectors comprising isolated DNA molecules comprising sequences selected from ORFs 1-13 of the five viral strains identified in the [patent-in-suit] includes [plaintiff's] PCV WT2/1 isolate. . . . [Plaintiff's] vaccine is not a vector that comprises a sequence selected from ORFs 1-13 of the five viral strains identified in the [patent-in-suit]. Therefore, the Court determines that [defendant] surrendered the territory encompassing [plaintiff's] isolate and that the presumption of prosecution history estoppel applies." In granting plaintiff's motion for enhanced damages, the court noted that "also favoring enhancement is [defense] counsel’s litigation conduct, specifically during trial. Throughout the course of trial [defendant's] trial counsel persisted in arguing that it was somehow improper for a non-practicing patent owner to sue for money damages. He further persisted in improperly trying to equate [plaintiff's] infringement case with the current national banking crisis implying that [plaintiff] was a banker seeking a 'bailout.' These improper arguments were made in spite of the Court’s warnings." "Logical inconsistency" of an asserted claim resulted in a ruling of invalidity for lack of enablement and utility. "The primary trouble occurs within steps (1) and (2) . . . [T]he only way step (2) can ever be performed is if a 'data information message' is a subset of an 'unmodified message.' However, the preamble of claim 3 itself differentiates 'data information messages' from 'unmodified messages' and 'control messages' . . . Finally, if step 2 somehow is performed, it explicitly requires the performance of step (8), which in turn requires that 'if the message is a control message parsing and processing the control message.' Again, step (8) cannot be performed if a receiver is configured only to receive 'data information messages.' There is a clear logical inconsistency within the claims." In granting defendant's motion to transfer, the court rejected plaintiff's argument that the district's "rocket docket" warranted retention of venue. "[A]lthough it may be true that Plaintiff will experience a speedier resolution of its action in this district, the Court cannot ignore the fact that the interest of justice remains on the side of transfer. . . . [I]f the Court were to give such a consideration commanding weight, all cases filed in this district would be effectively immune from transfer." Defendants' motion to stay pending reexamination was denied even though "the USPTO has issued a final rejection of all asserted claims of the [one patent-in-suit] and an initial rejection of all asserted claims of [the other patent-in-suit]." Instead, the court ordered the parties to "confer on an appropriate schedule to complete the court-ordered discovery in time to meet the current trial setting." 8. What is the total amount of damages (in dollars) that Medtronic should be awarded for AGA's infringement? $57,807,189.00"
Following a bench trial, the court found that defendant's ANDA products "will induce infringement" of the asserted patents because, among other reasons: (i) defendant's "[l]abeling specifically encourages infringement," (ii) defendant's "[l]abeling nowhere advises against the mixing or diluting of the ANDA Products to infringing concentrations", (iii) defendant's "collaboration with [a third party] to market and sell its ANDA Products to customers that will only use the products in infringing ways," (iv) defendant's "act of seeking an 'A' substitutability rating for its ANDA Products, so they may be substituted for all prescriptions of [plaintiff's product] . . . without any need for physician intervention or approval," (v) defendant's "acts of targeting all [customers of plaintiff's product] with the intent that purchasers of the ANDA Products will use them for all the same purposes," (vi) "sales forecasts that showed a marked increase in sales of [noninfringing concentrations of defendant's] ANDA Products immediately after [defendant] submitted an amendment removing [a product with an infringing concentration] from its ANDA submission," (vii) defendant's "targeting of group purchasing organizations . . . [where] dilution and mixing of higher concentrations . . . is a routine practice," and (viii) defendant "did not obtain an opinion of counsel relating to its possible infringement of [plaintiff's] asserted patents." (NJD August 3, 2009, Opinion) (Pisano, J.). •Transauction LLC v. Bidz.com, Inc. et al. , 2-08-cv-00232 (TXED August 3, 2009). •Nuance Communications, Inc. v. Vlingo Corp., 5-08-cv-00102 (TXED August 3, 2009). •Novartis Vaccines & Diag., Inc. v. Hoffmann-La Roche Inc., 2-07-cv-00507 (TXED August 3, 2009). •Thermal Scalpel LLC v. Covidien Ltd., 2-08-cv-00312 (TXED August 3, 2009). •LML Patent Corp. v. JP Morgan Chase & Co., 2-08-cv-00448 (TXED August 3, 2009). •IP Co., LLC v. Oncor Electric Delivery Company LLC., 2-09-cv-00037 (TXED August 3, 2009). •Motorola Inc v. Vtech Communications, Inc., 5-07-cv-00171 (TXED August 3, 2009). The court denied plaintiff's motion for summary judgment that defendant was "estopped under 35 U.S.C. § 315(c) from asserting in this action that the ‘605 patent is invalid based on grounds that [defendant] asserted or could have asserted in the inter partes reexamination proceeding" because the reexam proceeding remained ongoing. "Neither party cites any case, and the court could not locate one, in which a court has determined when an inter partes reexamination becomes final for the purposes of § 315(c), thereby triggering its preclusive effect. . . . [T]he court concludes that a patent claim is not 'finally determined to be valid and patentable,' 35 U.S.C. § 315(c), in an inter partes reexamination proceeding until the USPTO issues a reexamination certificate." The magistrate judge recommended granting defendant's motion to dismiss for failure to state a claim of direct infringement. "Google argues that its interactions with users and AdWords advertisers constitute arms-length transactions, and that [plaintiff] has not alleged that Google acts as a 'mastermind' directing or controlling the actions or participation of users. The court agrees. [Plaintiff] has not alleged that those who participate in Google AdWords do so at the behest of Google, even under an expansive interpretation of 'direction or control,' and . . . [plaintiff] has failed to properly allege that [defendant] exercises even a modicum of control over Google AdWords users to satisfy the Federal Circuit's joint infringement standard."